This recipe is just one of these low point, filling creations, perfect if you don’t have much time to cook when you get home from work. I bought the pre spiralised noodles here for quickness but feel free to make your own. If you do buy the pre-cut ones however, make sure they are nice and fresh as sometimes they go a little soggy if they have been in the fridge a few days! In a bowl mix ½ tsp Chinese five spice, juice of ½ lemon and a pinch of crushed chillies. Add the salmon, coat and pop in the fridge to marinade until you need it (ideally more than 15 minutes). Next take a large frying pan, spray with 1kal and on a medium heat fry the garlic with ¼ tsp crushed chillies. After a minute, add the soy, honey, ½ tsp five spice, ¼ tsp crushed chillies and tomatoes. Fry until the sauce reduces a little and the cherry tomatoes start to soften then add the chickpeas, BNS and courgette noodles. Stir fry for a few minutes until the noodles soak up some of the sauce and the BNS noodles start to soften. While the noodles are cooking take a griddle pan, spray with 1kal and add the salmon. Cook on one side for 3-4 minutes and then turn and cook on the other side until the salmon is cooked through to your liking (you could also grill the salmon if you prefer). Once the salmon is almost cooked, pour the remaining marinade into the noodle pan and toss through with most of the coriander (keep a little garnish). Serve the noodle combo in a bowl and top with the salmon. Finish with a sprinkle of coriander and a slice of lemon. I made this tonight and it was delicious – my husband loved it too!! I’ve made quite a few of your meals now so thanks for keeping the weight loss journey interesting and tasty. Ah so pleased you enjoyed it Linda! Tired this recipe the other week and absolutely loved it. Really tasty and such a lovely change from my usual weight watchers meals. Will definitely have again. 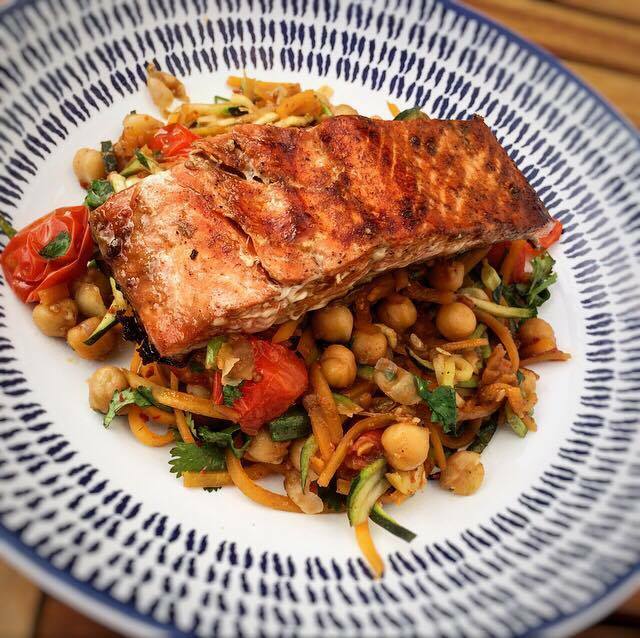 Utterly delicious and different flavours, love salmon and this was such a change and a treat. Definitely going to be a favourite from now on. Thank you, Laura. Third recipe of your I’ve tried, all excellent. I have just had the 5 spice salmon and boodles for tea. It was absolutely delish. I couldn’t get boodles so I made it with BNS crinkles . I think this is now one of my favourite recipes of yours and will deffinetly be cooking it again.